I have always traveled with my paints and sketchbook and was fortunate to live in Europe while the recipient of a Fulbright Scholarship, and then later in Asia as the awardee of a grant from The Henry Luce Foundation. I have books filled with my European and Asian travel drawings and watercolors. Some of them became illustrations for magazines such as The New Yorker, Gourmet, and the New York Times. 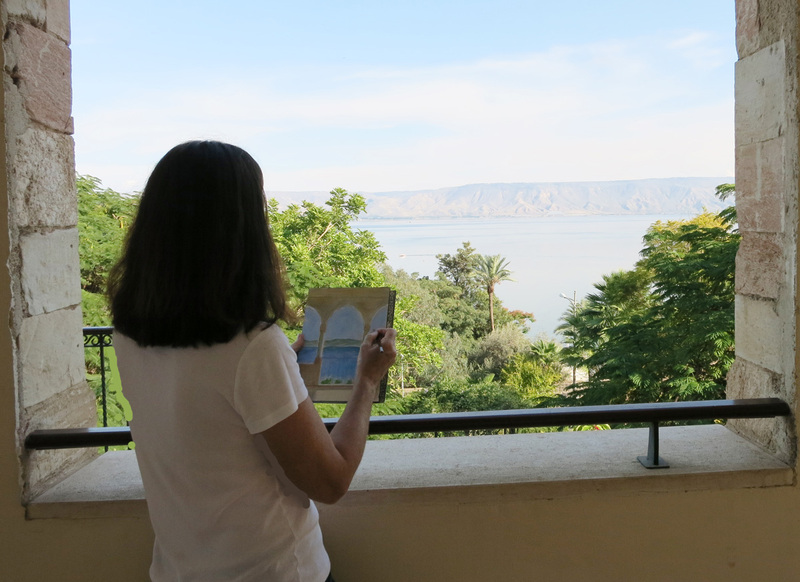 I continued the tradition of traveling with my paints during a recent trip to Israel, returning to places I had painted years ago such as Jerusalem, Masada and the Sea of Galilee. 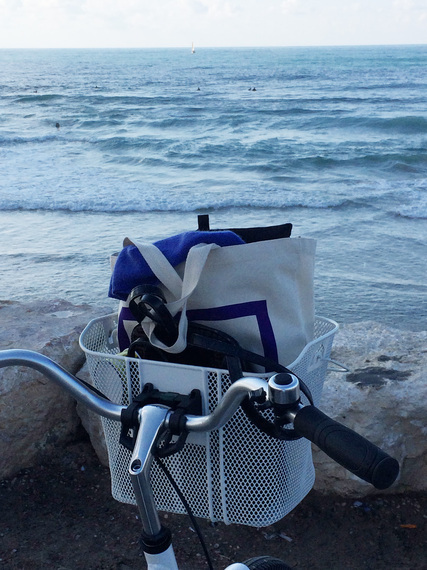 I went to new places such as Jaffa and Akko and En Gedi. I sat on steps, in alleyways and, if I was fortunate, on a terrace or table where I could set up my supplies. Painting in JaffaOne of my favorite places to go was to the old city of Jaffa. I would put my supplies in my bicycle basket and ride down the coast past the surfers and sunbathers of Tel Aviv Beach to the old city. 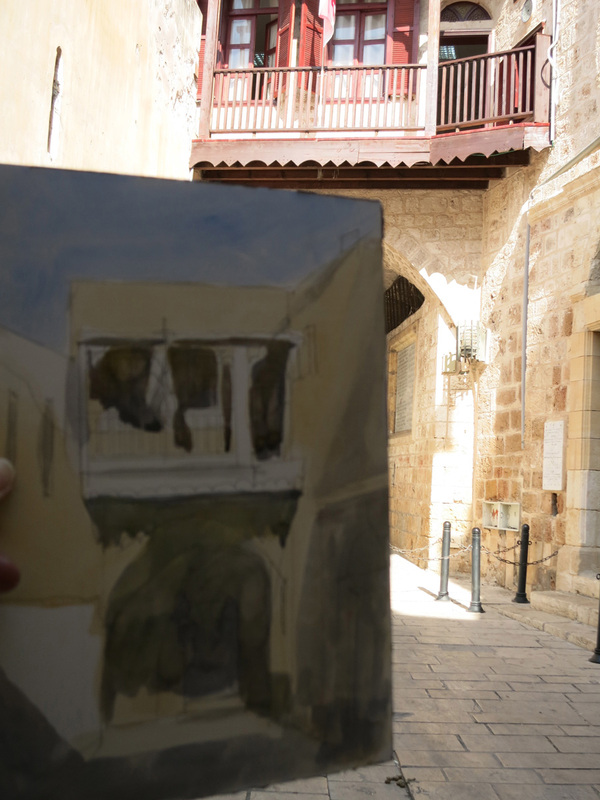 I also visited Akko and ended up painting the small square in front of the Greek Orthodox Church. AkkoWhat I find unique about painting on site is that I can observe and learn about a culture — not only am I painting, but I am listening to the conversations and observing while also interacting directly with my subject. The downside, at least on this trip were ants, flies, cats and rain. Years ago I spent time in Jerusalem drawing and painting the city and the rooftops, I again returned to paint the city. I paid five shekels at the Petra Hostel (where President Grant once stayed in it’s better days) and went to the roof for a great view of the city. I also discovered the view from the King David Hotel, considered the grande dame of Jerusalem hotels. If you are fortunate enough to stay there the views of the old city are spectacular. The King David’s terrace was another great place to paint the exterior city with beautiful views of the city wall away from the hustle and bustle (and also affords a delicious lunch, I recommend the pumpkin soup.) Be sure to wear comfortable shoes while walking around the old city. Another favorite place to paint was the Sea of Galilee. I climbed up to Mt. Arbel (a short drive from Tiberius, it is a national park) and there are some great vistas looking down from the cliffs. I spent time painting at the Scots Hotel, an idyllic setting with a beautiful tiered garden and a selection of trees and flowers tailored for the Botanist. The Scots Hotel was established by the Scottish Church in 2004 in the historic 19th century compound of the Scottish Hospital. It is a great base to explore the area and to paint — I found myself at the top of the old hospital building looking out on the Sea of Galilee through the arches for a final painting. 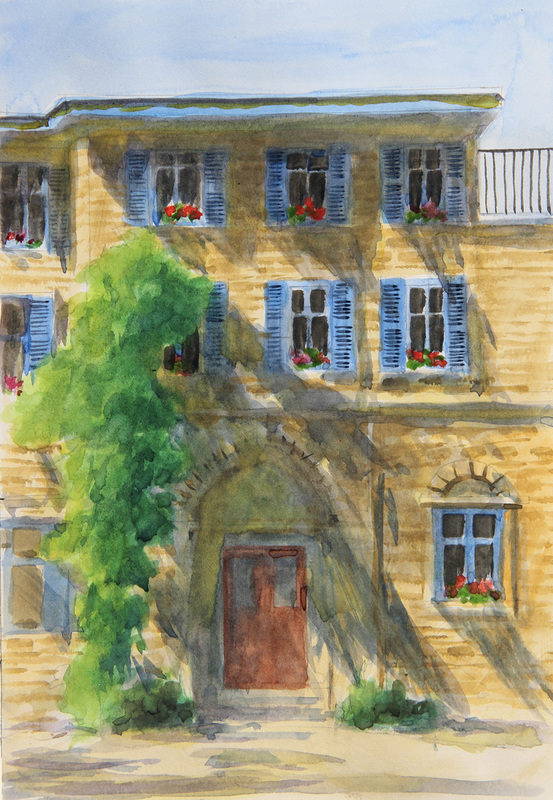 I have been very involved with the U.S. State Department’s Art in Embassies program and my paintings have been on exhibit at the U.S. Embassy Residences in Paris, Madrid, Prague, Oslo and in Eastern Europe and Africa. I currently have a painting on exhibit at the U.S. Embassy in Hong Kong, so I was particularly pleased to see the exhibit at the U.S. Embassy Residence in Tel Aviv. I took a break from painting in Tel Aviv to visit the exhibit ‘Childhood’ there. 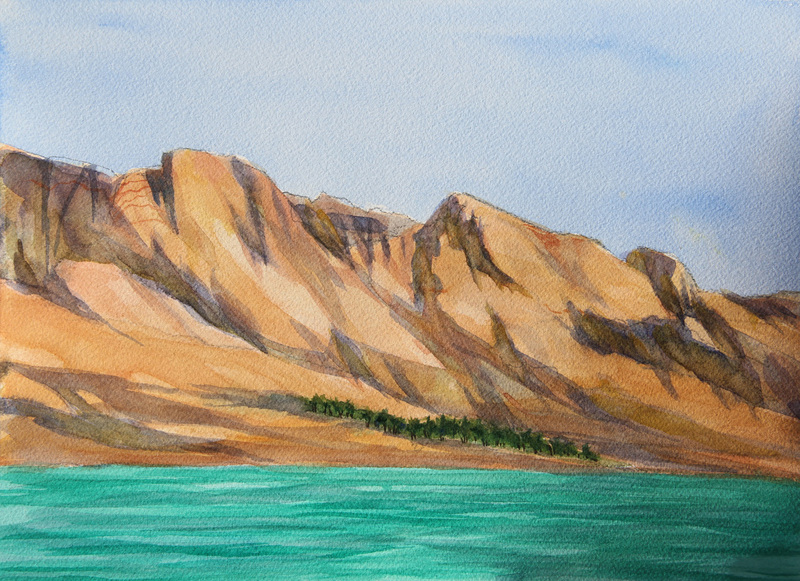 I returned to The Dead Sea and Masada and would get out by 6:30 to paint the sunrise and the shadows cutting the mountains with the turquoise water foreground before it rained. The weather changed dramatically and the wind was so fierce it knocked over my water onto my paints and blew my chair away into the Dead Sea. I can only imagine the severity of dust storms. The Dead SeaIn the afternoon I went to Masada which is quite extraordinary (my second visit and the frescos and mosaics from Herod’s palace were just as fresh as I remembered). 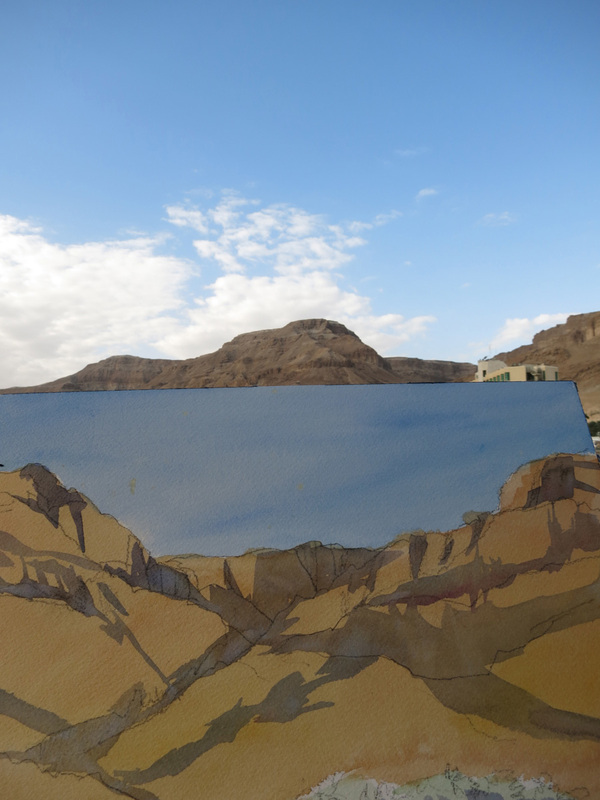 I was painting at Masada when it once more started to pour, which reminded me again of the obstacles of plein air watercolors. The benefits, however, outweigh the obstacles It is a direct response to the place and etches in my mind unique images as I am intently looking and not just taking a quick photo and moving on. Years ago, when I was a teaching assistant at Harvard University I took a class at Harvard College, The History of the Jews with Professor Twersky. His teaching assistant and I became friends and he purchased one of my line drawings of the roofs of Jerusalem to give to his wife (this was the time period I was doing New Yorkerdrawings). He took the art with him to Jerusalem where he now lives so although I’ve left, some of my art is still there.